Before you start reading, please be sure to check out our previous post on the subject of ROI and eliminating print servers in your organization using PrinterLogic. In that post we took a brief look at how quickly our customers surveyed typically saw ROI. And the stats were pretty impressive: Nearly half did so in under six months and 75% achieved ROI in 12 months or less. We also gave some examples of enterprise printing turned cost-effective: The small K-12 school district that saw more than 100% ROI in three months, the Fortune 500 insurance company that saw more than 200% ROI after six months, or the government agency that saw a remarkable 400% ROI after eighteen months. But how do those individual examples stack up in the aggregate? 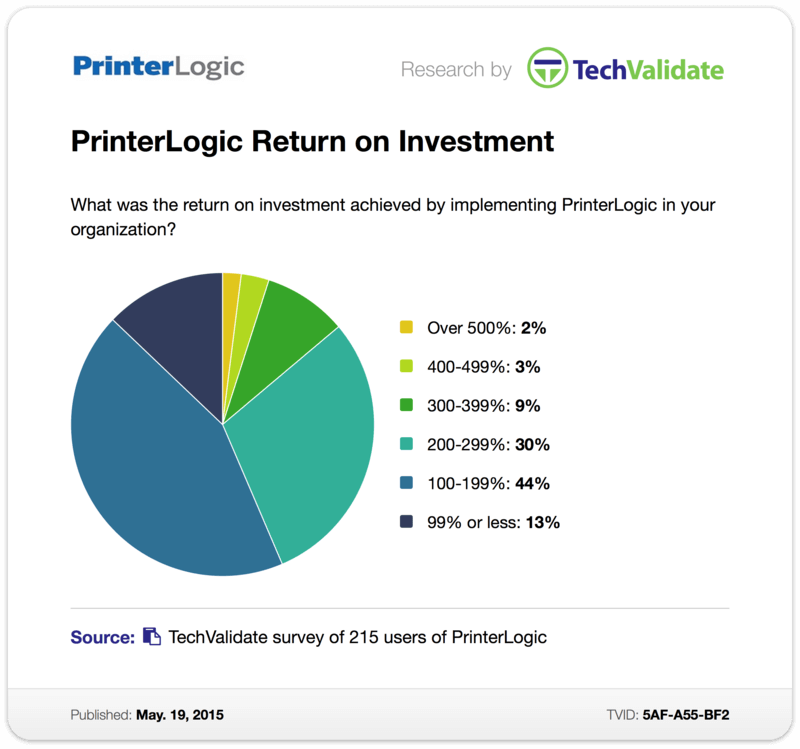 That same TechValidate survey shows that an amazing 83% of our enterprise customers realized between 100 and 400% ROI after adopting PrinterLogic as their print management solution. A full 44% of those surveyed showed ROI of 100–199%. Another 44% of saw ROI of 200% or more, with some additional customers seeing ROI as high as 500% or greater. Mind you, these weren't similarly sized customers from one particular sector. They ran the gamut—small, medium and large organizations operating in fields ranging from education to agriculture, chemicals, insurance and IT. Such as the Fortune 500 computer services firm with more than 100 sites that saw an ROI of more than 300% in one year. Or the banking company that saw equally amazing results in just three months ("Users are not afraid of printing anymore," they said). Or the large enterprise construction company that saw an ROI of over 400% in six months, owing to a 70% drop in three crucial areas: time spent on print management, print-related service desk calls and printer downtime. Even the organizations that saw a modest ROI (by comparison, of course) did so in record time. One Fortune 500 energy and utilities company experienced more than 100% ROI in under six months. A small business providing financial services also saw an ROI of more than 100% after implementing PrinterLogic printer management software. Believe it or not, that took less than three months. So when you take a closer look, not only at the time in which these organizations realized ROI, but also at the percentage of ROI that was achieved, the real question is: Can your organization afford not to eliminate print servers by installing PrinterLogic as your enterprise printer management solution?